• biologic agents also referred to as "biologics" or targeted immune modulators such as antitumor necrosis factor agents (eg, etanercept, adalimumab), belimumab, and rituximab. • viral reactivation, eg, varicella-zoster virus (shingles) or worsening of a chronic viral infections such as hepatitis B infection. Vaccines are typically classified as inactivated "killed antigen" vaccines or as live attenuated vaccines (LAVs). Killed vaccines have no live components in them and are extremely safe and effective, while LAVs contain living virus or bacteria, making them markedly weakened or "attenuated." The virus or bacteria in LAVs will grow in a vaccinated individual, but because they are weak, they will cause no or very mild disease in persons with normal immune systems. 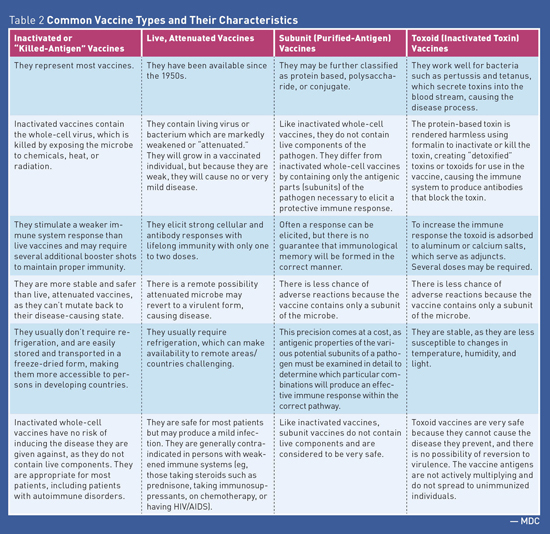 See Table 1 and Table 2 for additional information about vaccine types. Vaccines are generally safe and effective for persons with AD and are recommended by standard vaccination guidelines. Some studies have found mildly impaired immune responses to vaccines among patients receiving long-term immunosuppressive therapy, but postvaccination antibody titers are usually sufficient to provide protection for the majority of immunized individuals. The accumulated data on the safety and effectiveness of vaccines warrant immunization with the majority of vaccines for patients with AD, especially vaccination against influenza and pneumococcal disease. Despite clinical recommendations for vaccination protocols for this population, vaccination rates are low for persons with AD. This may be due to education about the differences in types of vaccines, inadequate communication between primary care physicians and specialists, patient misconceptions about safety, and fear of flares, which are sudden and severe onset of symptoms. In general, while flares are possible, they are rare when guideline recommendations are followed. Inactivated vaccines can be administered safely to patients with AD even if they are undergoing immunosuppressive therapy, although the level of protection may be lessened. Persons with AD who become infected with influenza, pneumonia, or hepatitis B are at increased risk of more severe disease and increased mortality/morbidity than immunocompetent persons. Therefore, persons with AD are strongly encouraged to receive these vaccinations. Influenza (intramuscular injection), pneumococcal, and hepatitis B vaccines are inactivated vaccines and are safe and generally sufficiently immunogenic in patients with AD. • Influenza (intramuscular): For patients with AD, a yearly intramuscular (which is inactivated) influenza vaccination is recommended. Patients aged 65 and older should receive the high-dose vaccine, which has been shown to be more effective in this age group. • Pneumococcal: The CDC recommends vaccination for all immunosuppressed adults naive to pneumococcal vaccinations. The CDC recommends vaccination with PCV13 (pneumococcal conjugate vaccine) followed by PPSV23 (pneumococcal polysaccharide vaccine) in eight weeks to one year later. • Hepatitis B vaccine (HBV): For patients with AD, the severity of hepatitis B infection is more severe with increased morbidity rates than for persons who are immunocompetent. Therefore, hepatitis B vaccination is of particular importance in patients with AD, as biologic therapy can increase the risk of reactivation in those infected. Before initiating biologic therapy, HBV serology should be checked in all patients. Some experts recommend initiating hepatitis B vaccination at the time an AD is diagnosed. Tetanus, diphtheria, and acellular pertussis vaccines are inactivated vaccines and, as in the general population, the immunization status of patients with AD should be checked and vaccination considered for tetanus, diphtheria, and pertussis vaccination. • Tetanus and diphtheria: Tetanus and diphtheria vaccinations are recommended once every 10 years. • Pertussis: The pertussis vaccine helps protect against whooping cough, which is highly contagious, causing prolonged distinct coughing. Pertussis remains incompletely controlled in the United States and is considered an epidemic worldwide. The pertussis vaccine is recommended in childhood with one booster in adulthood. 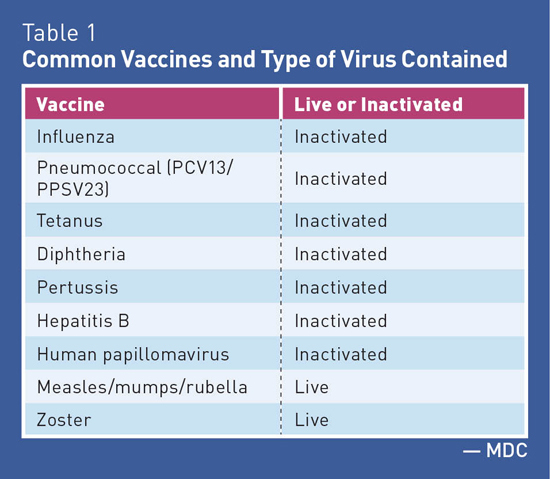 Live vaccines (measles/mumps/rubella, oral poliomyelitis vaccine, yellow fever, and varicella zoster) are contraindicated in patients with immune-mediated inflammatory disease who are undergoing immunotherapy. Although the varicella zoster vaccine is a live vaccine and is, as such, contraindicated in immunocompromised individuals, some consider the risk-to-benefit ratio for this vaccine beneficial for patients on low-dose immunotherapy, especially since rescue therapy with acyclovir is possible in case of virus persistence or infectious symptoms after varicella zoster vaccination. This vaccine is recommended for all immunocompetent patients aged 50 or older with AD; however, because ZOS (shingles vaccine) is a live vaccine, it is contraindicated when patients with AD are receiving biologics or high-dose corticosteroids. ZOS should be delayed for a least one month after discontinuation of such therapy. • low-dose treatment defined as using methotrexate (<0.4 mg/kg/week), azathioprine (<3 mg/kg/day), or 6-mercaptopurine (<1.5 mg/kg/day) for the treatment of rheumatoid arthritis, psoriasis, polymyositis, sarcoidosis, inflammatory bowel disease, or other conditions. ZOS does not need to be delayed in these persons, and it can be administered to contacts of patients with AD and other chronic diseases or altered immunocompetence. Remember that LAVs are of greatest concern because of the risk of severe infections following live vaccination of an immunosuppressed patient receiving a biologic drug or high dose corticosteroids. Persons with AD who are being treated with immunosuppressive therapy must be regarded as immunocompromised individuals, although the extent to which immune competence is impaired depends on the type and dose of medication used, as well as the duration of therapy. Administer LAVs no earlier than three to four weeks before the start or restart of immunosuppressive therapy to ensure that virus replication has ended before impairing a patient's immune competence. In order to safely administer a LAV to a person with AD with respect to the exact time period after which immunosuppressive therapy has been discontinued, it depends on the type, dose, and duration of the therapy; however, a safe rule of thumb is to allow a period of three months for the immune status to be completely restored, except for corticosteroid therapy, where a waiting period of one month is thought to be sufficient. — Mark D. Coggins, PharmD, CGP, FASCP, is vice president of pharmacy services for Diversicare, which operates skilled nursing centers in 10 states. 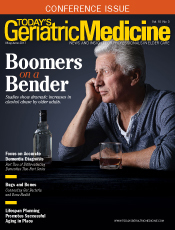 He was nationally recognized by the Commission for Certification in Geriatric Pharmacy with the 2010 Excellence in Geriatric Pharmacy Practice Award. 2. Williams WW, Lu PS, O'Halloran A, et al. Surveillance of vaccination coverage among adult populations — United States, 2014. MMWR Surveill Summ. 2016;65(1):1-36. 3. Vaccines do not cause autism. Centers for Disease Control and Prevention website. https://www.cdc.gov/vaccinesafety/concerns/autism.html. Updated November 23, 2015. 4. Murdaca G, Orsi A, Spanò F, et al. Influenza and pneumococcal vaccinations of patients with systemic lupus erythematosus: current views upon safety and immunogenicity. Autoimmun Rev. 2014;13(2):75-84. 6. Brause B. Vaccinations and lupus: an update of what you should know. Hospital for Special Surgery website. https://www.hss.edu/conditions_vaccinations-lupus-update.asp. Published June 17, 2014. 7. Rahier JF, Moutschen M, Van Gompel A, et al. Vaccinations in patients with immune-mediated inflammatory diseases. Rheumatology (Oxford). 2010;49(10):1815-1827.